Just posting an update to let you all know that the site is still active. If you have any questions about the website, I can be reached at haroldramisforever@hotmail.com. However I AM NOT HAROLD RAMIS and I do not know him, therefore please do not send correspondence intended for him, it will be ignored. The site has been totally revamped, and I am working on cleaning up pages that didn't correctly "migrate" to the new design. The home page has been completely cleaned up and all the links should work now. Please report any dead links to me. I'll be continually putting the old pictures back up and doing other housecleaning so check back frequently. For more information please visit the Museum's website at movingimage.us You can buy tickets online at https://shop.movingimage.us/shop/catlist.php?cPath=57 or by phone 718-784-4520. Harold's latest film, "Year One", has completed production and is slated to be released June 19. The movie stars Jack Black and Michael Cera, and it is directed, co-written and co-produced by Ramis.You can view the film's official website here www.sonypictures.com/homevideo/yearone/ and the IMDB page here www.imdb.com/title/tt1045778/ . I have added many items to the Merchandise page, where you can easily shop for Harold-related items from Amazon.com. I encourage you to check it out every time you visit this site, as I will be continually adding items to the page. Also, if you follow my links to the Amazon.com website and end up buying any of the items that I featured, I will get a small [very small] cut of the profits. It's not much, but if I make enough money I might be able to fufill my dreams of turning this into an ad-free website with its own domain name, and that would make us ALL happy, wouldn't it? So, "Thank you" in advance for browsing my Merchandise page! I've added a recent pic of Harold with a fan; I wasn't sure where to put it, but it is currently residing at the bottom of the Filmography page. Check it out, and many thanks to the dude in the picture for letting me use his photo. I received a tip via email that a CGI-version of "Ghostbusters 3" is going to be made with the original cast returning for voice overs. I have not been able to confirm this for sure; I can, however, confirm that a video game of the original Ghostbusters IS in the works, and that the original cast (including Harold, Murray, Aykroyd, Moranis, Ernie Hudson, and Annie Potts) are reuniting to voice their roles. Be sure to join the fight to a) get all the music rights cleared and b) get SCTV released in complete seasons rather than "Best Of" compilations. The website for the SCTV On DVD Campaign is HERE: http://runstop.de/sctv/faq.html . I AM NOT HAROLD RAMIS. This is a FANSITE. Please please PLEASE do not e-mail me correspondence that is intended for Mr. Ramis. Thank you. Just so everyone is aware, I do not have regular Internet access right now and will not until sometime in August 2006, and that is why I have not been updating the site or responding to e-mails. The site is still active and will continue to be regularly updated in August. I added a video clip from the movie "Stripes" that I found on You Tube; it's on the Media page. Check it out. I've added a Merchandise page with links to Amazon.com products (DVDs of movies that Harold has been involved with, movie posters, and books). Check it out. Also -- there is a very short survey near the bottom of the page, if you could take a moment to give me some feedback it will really help me make improvments to the site. Thanks. I've been trying to straighten up the site a little bit. The Links page now has been cleaned up somewhat -- articles and interviews now have their own pages. I hope to be adding more links in the near future, so check back frequently. Also, I've added another sound clip and moved all the sound/video to a new page called Media . The Ramis-directed film "The Ice Harvest" is in theatres now. It stars JOHN CUSACK, BILLY BOB THORNTON and RANDY QUAID. 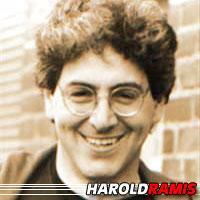 Monday 21 November 2005 -- Harold Ramis is 61 years old. Yet another new movie -- a BIOPIC?!!! I'm reporting an UNCONFIRMED RUMOR that, at some point in the future, Harold plans to make a movie about his experiences as an orderly at a mental hospital [that was his first job after college, apparently] and he intends to cast actor JAKE GYLLENHAAL in the lead role. Harold has supposedly been working on a new film that stars OWEN WILSON. It's slated for release in 2006 but the project has been kept under wraps. Apparently, it's going to be some sort of a historical comedy. That's all I know right now. Please take a few seconds to give me some feedback about this site, I would really appreciate it. Which part of this site do you find most interesting or useful? How would you rate the overall quality of this site? Type or paste your HTML here. Harold Ramis Fans Online is an unauthorized fansite and is not officially affiliated with Mr. Ramis or with any of his films.